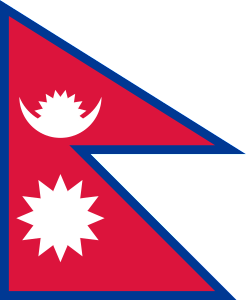 Nepal is located in the middle of South Asia in the Himalayas. This state lies between India and China. In 2008 it became the Federal Republic of Nepal. One of the main highlights of this relatively small country is the world’s highest peak – Mount Everest. But it is not the only reason why Nepal is visited by so many travelers. Among other frequented spots are the local Buddhist Temples that are favourite sites for many people who are interested in Eastern religion. The main source of living for local people comes from agricultural and, because of unemployment, about one-third of people live below the poverty line. We plan to stay in Nepal for about three weeks within our round the world trip. In comparison with hectic Western countries, we expect to encounter here helpfulness, peace and relaxation. We will start our trip in Patan, which is now part of Kathmandu. The original name of this city was Lalitpur, that could be translated as a City of Beauty. According to the information we have, Patan should be a quiet city with many historical sites. The main attractions we want to visit here are the local temples, dedicated to different gods. For instance we would like to visit the temple of Bhimsen Mandir, Krishna Mandir or Mahabouddha Temple, which is completely covered with tiles depicting the Buddha. From this part of the capital city of Nepal, Kathmandu we will move to other places. It is worth mentioning the Royal Palace. This palace is full of stories, despite its history being relatively short. In 2001, the royal family was massacred here, including King Birendra. At present, the palace is open to the public and you can see there a museum that offers views into the past of this country and the lives of the monarchs. Travelling in Nepal would never be the perfect experience if we didn‘t see the largest mountain of the world, Mount Everest. Of course we do not intend to climb up it. We are not ready physically, mentally and financially. We want to take a few days trek into the mountains. Trekking in Nepal is a must when we go there! The roughly 12-day trek that is going to take us to a height of around 4000mwhere, in places, there is the magnificent view of the “roof of the Earth”. It will not be an easy journey, but for that feeling and the view it is definetely worth trying! After returning from the trek we want to visit one of the four major Buddhist pilgrimage places called Lumbini. According to legend, a prince was born there who later became Buddha. This place is now a UNESCO World Heritage Site. 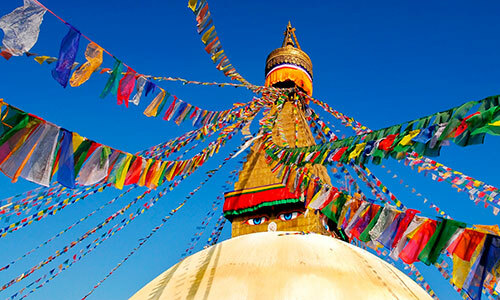 Another place that we want to visit is Boudhanath. It is a place where Stupa is located, a dome shaped structure built as a Buddhist shrine. It is an important place for its connection with the Buddha himself. When travelling in Nepal we will need to use the local transport. Nepal Transport Services is not so developed. Quite common are bus rides that are supplemented by shared taxis. Both are often crowded. Poverty in this country substantially reduces the costs of transportation, therefore we will choose for our trip across Nepal our own taxi. Thanks to the location of the Nepal, the local cuisine is greatly influenced by Indian and Chinese cuisine. Most meals are without meat and quite spicy. We would like to try there the main Nepalese dish called Dal Bhat. The basis of the meal is rice and a spicy lentil soup. Another dish is tarkari, which is seared seasoned vegetables, based according to the season, mostly potatoes. The last part of this food is pickles, which are very spicy vegetables. Our next destination will be China. It is going to offer us a view on Asian culture from a different angle. However, nothing may replace the simple beauty of the country of Nepal and their people.